It’s safe to say that cherry tomato and mango chutney would not be on anybody’s list of pizza toppings. Megan O’Dea’s is sweet (I taste molasses) with tang that registers calmly at the back of the mouth. You can buy a bottle for $15 at Pi, her Kings Road pizza restaurant. Yes, it’s a pizza topping and a celebrated one at that. O’Dea’s seriously good chutney, along with minty pesto, lamb, smoky cheese and the pizza crust underneath it, snagged a top prize in, of all places, Las Vegas, Nevada. While celebrity chefs like Gordon Ramsay, Bobby Flay and Mario Batali have made Las Vegas a culinary destination for upscale dining, Sin City also attracts diners and chefs obsessed with pizza, all kinds of pizza. It’s the home of the International Pizza Challenge. Megan O’Dea is very proud that she won first place in the non-traditional division at the Vegas competition for her pizza featuring Pi’s cherry tomato and mango chutney and those other ingredients I mentioned. Although nothing beats her chutney as a non traditional topping, a scan of Pi’s pizza toppings reveals O’Dea’s penchant for less utilized ingredients that might raise an eyebrow among diners with a traditional pizza palate. Grilled asparagus, sweet corn, toasted walnuts, red grapes and pear and onion compote come to mind. O’Dea’s somewhat catholic taste can also be seen in Pi’s décor. 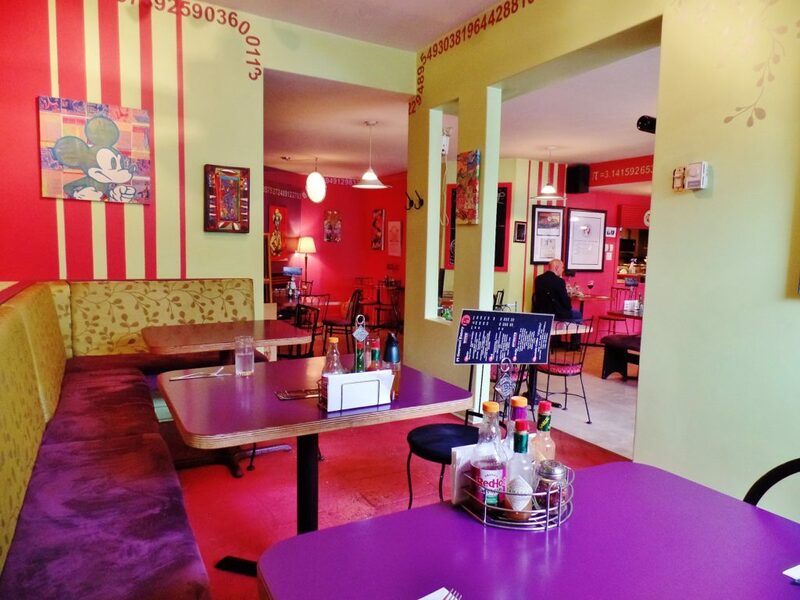 The restaurant is awash with accents of purple, orange and red. One nook has an angry Mickey Mouse grimacing down at you, while in another, it’s a stiff Hank Williams Sr. with frozen Mona Lisa smile. Still another has a picture of a robot, the kind seen in 1930s comics. The pi symbol is prevalent (naturally) and each wall contains a top border consisting of numbers (pi) that in some corners are painted so that they appear to be tumbling downward to the floor, speaking of which (the floor) looks like it’s seen better days. Ever the tireless worker I wasn’t surprised to see Megan O’Dea wiping down tables and taking orders when we entered Pi. It’s her commitment to the business that’s kept Pi in action for almost a decade. And, of course, the rest of Pi’s team deserves credit too. While physical parts of the restaurant may have faded a little since Pi opened, the food is as bright as ever. 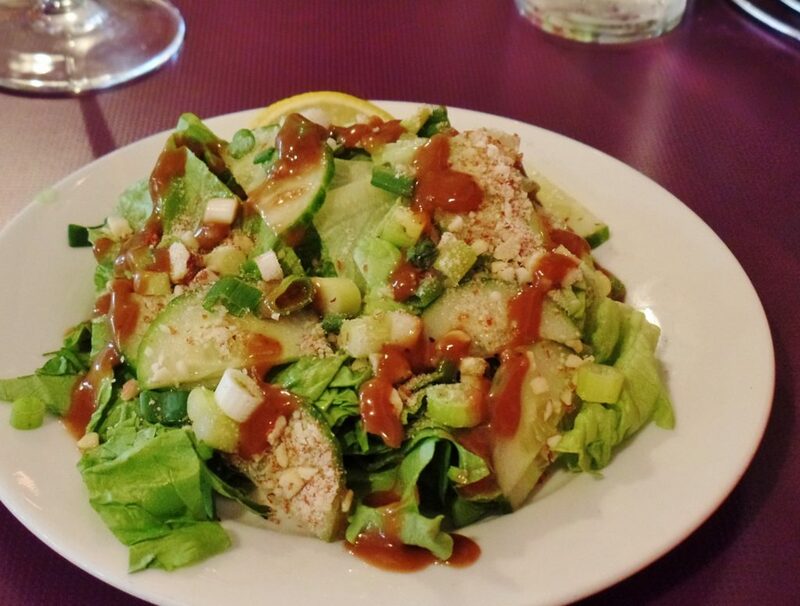 Pi’s sunrise salad had a sunrise glow about it thanks to reddish tinged streaks of citrusy pomegranate dressing. It reminded me of a salad just casually pulled together at a farmers’ market, with exquisitely fresh lettuce, cucumber and spring onions. A few mouthfuls, including the topping of toasted almonds, confirmed the salad’s lusciousness. Pi makes dough for more than pizza. Bread, plain crostini and mushroom crostini for example. 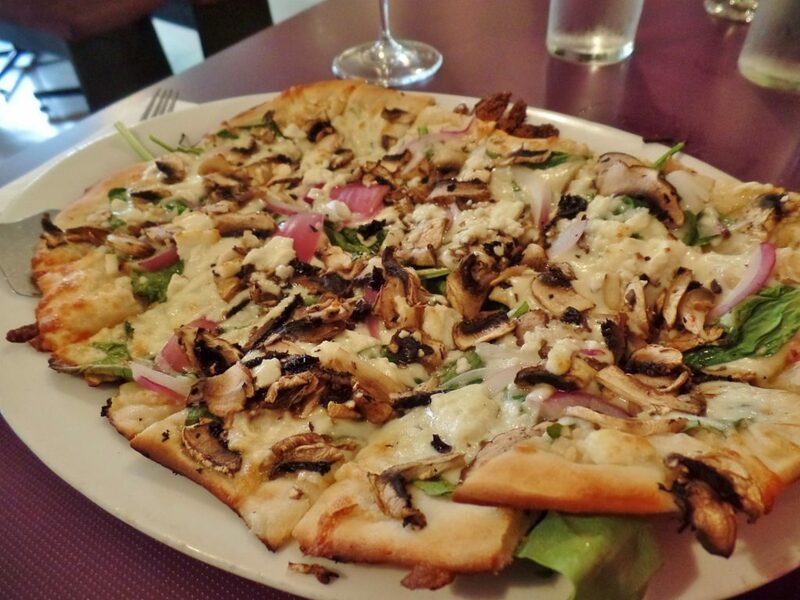 A platter of mushroom crostini contained thin crust slices topped with sliced mushrooms, red onion and melting cheese. Mushroom crostini washed down with cabernet was an excellent combination. I had some left to take home and enjoy again with a fizzy lager, an even better combination. Lately I’ve been having (and liking) the occasional pizza without cheese, which is probably unthinkable for some of you. But, if a hamburger without cheese and a ham sandwich with just the ham can be credible, why not pizza? 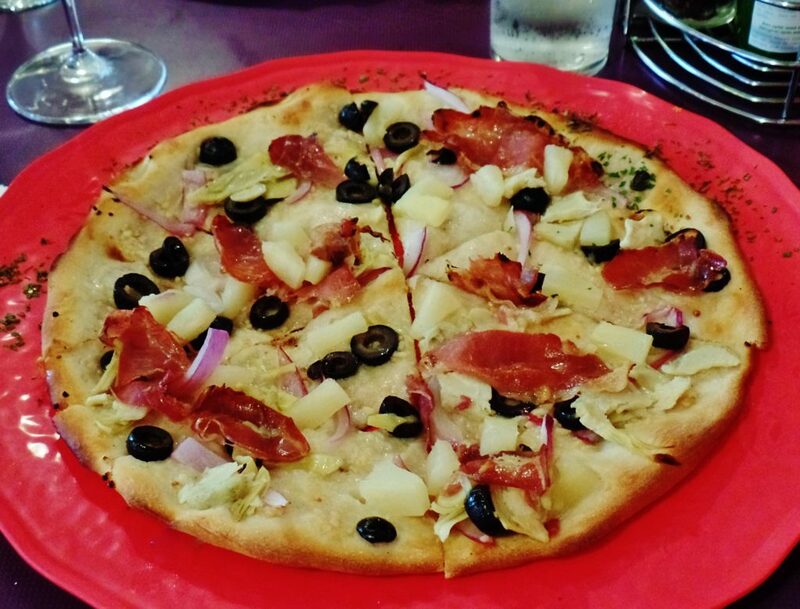 From Pi’s list of toppings we selected prosciutto, pineapple, black olives, artichoke hearts and red onion for our thin crust. I didn’t miss the cheese. In fact, I think the individual flavours of the ingredients were more amplified and more enjoyable than if the pizza had had cheese. Pi has pasta. Linguine carbonara was a treat. 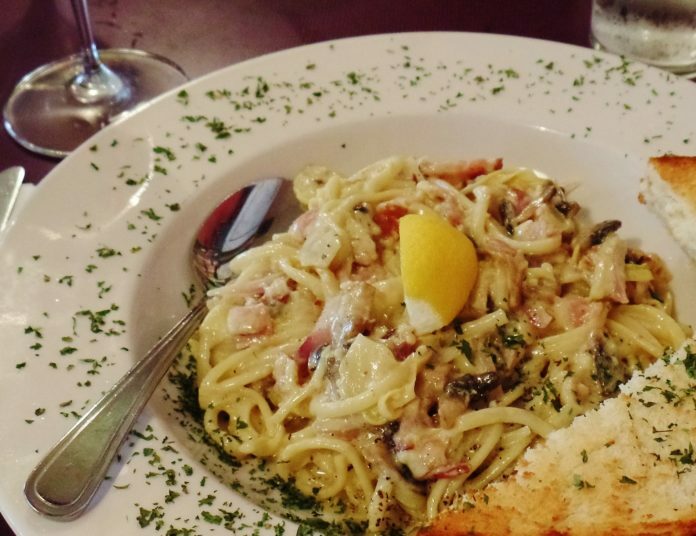 It’s not a spring or summertime pasta but just the thought of tasting what I hoped would be a well made carbonara was prod enough. The bacon and its special flavour permeated, the pasta was al dente and the creamy egg yolk sauce was limited to just a light coating. A couple of chocolate fudge cakes caught my attention, one with and one without dairy. 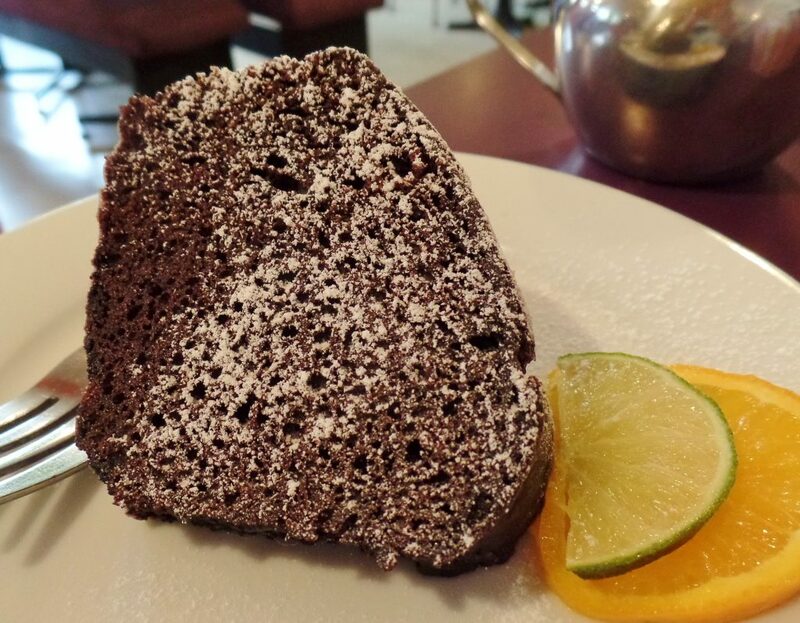 A wedge of the non dairy version arrived dusted lightly with icing sugar. I thought it would have been perfect with a cup of rich coffee. Although it was moist and tender, the texture was less delicate than a cake with dairy. Ontario peaches are in stores now and they’re tasting great. 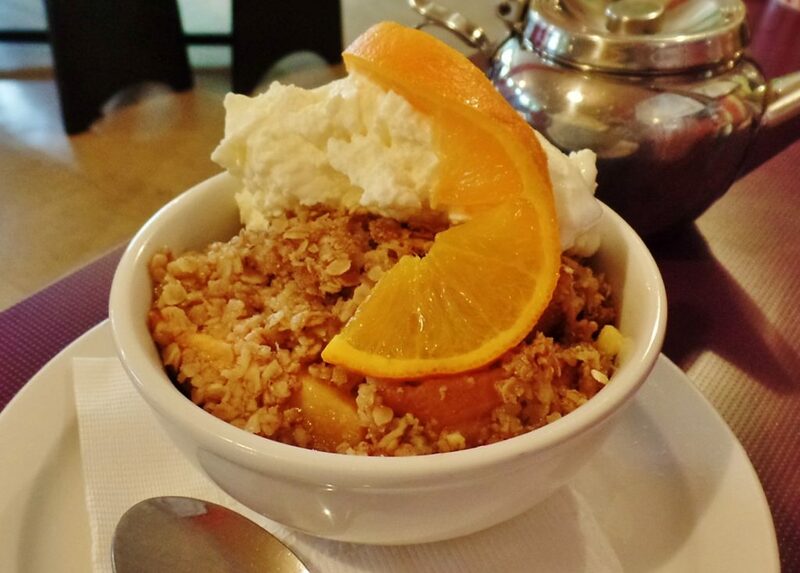 Pi regularly features fruit crisps. Peach was the flavour of the day. It came with fresh whipped cream on top. The crispy part was a tad gluey underneath but still, it was the kind of dessert that makes you smile. It’s good to see Pi still feeding regulars and new customers after nine plus years. It was an idea that became reality with hope, hard work, and I suspect a few prayers. Later, Megan O’Dea even managed to get out of Vegas a really big winner. How’s that for putting a nice bright bow on the story thus far? Price Supper for two with appetizers, drinks, tax and tip costs approximately $100. Service Friendly, efficient and accommodating. Beverages Beer takes pride of place at Pi. Some featured beers include Muskoka’s Detour IPA and Craft Lager, Guinness Blonde American Lager, Belgian Moon Wheat Ale and Shocktop Belgian Wheat Ale. Popular local beers and imports are available, including New Grist gluten free beer. Quidi Vidi is on tap. In addition to red or white sangria by the glass or pitcher, Pi offers about a dozen mostly mass produced wines. (I was glad to see Firesteed Pinot Noir from Oregon listed at $45 per bottle.) Spirits are also gettable via a number of hi-balls and specialty coffees. Wheelchair access Pi is not accessible.